Handing in your notice is not simply a case of waving goodbye to your old employers, but requires a good planning, organisation and professionalism. If you’ve just landed a choice new job the idea of passing on the good news to your present employers might not only seem a doddle but a very pleasant and satisfying doddle at that! However, it’s often surprising how when the time comes to actually hand in your notice, it can prove very stressful indeed, particularly if you’ve been with the company for a long time. As soon as you’ve received your official offer letter from your new company and you’ve definitely decided to accept, it’s time to start thinking about preparing your letter of notice. 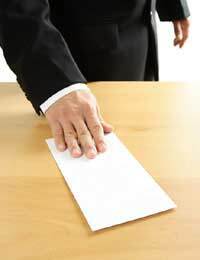 The letter of resignation should be short and to the point. There is no standard rule about whether it should be typed or handwritten, just as long as it isn’t an email and is printed on good quality paper. There’s no need to relate the reasons why you are leaving, or even excuses. Remember you have no reason to feel guilty. Remind yourself of the reasons why you decided to leave in the first place and then set about writing a letter that is professional but polite in tone. By all means thank your employer for the positive experience you have had at their company, even if it hasn’t been so rosy. Don’t forget that you want a good reference and may even decide to return, so it’s always best to leave on good terms. The letter should be properly dated, include the notice period you intend to serve as well as official leaving date, and also any contract pay that is outstanding. Once you have completed the letter and are happy with it then ask your boss for a private word. Don’t let time drag and the issue stew in your mind – get this done as soon as possible. Although you may be a little stressed by the prospect of announcing your departure, don’t be tempted to shy away from a face-to-face confrontation by surreptitiously slipping your letter of notice on your boss’s desk when they’re away on a coffee break. This is an important letter that needs to be discussed. Before you go into a meeting, think first about what you want to say. It’s worth bearing in mind that a common reaction for managers faced with an unexpected letter of resignation from a good member of staff is shock and even sadness. So bear this in mind when attending your meeting by acting in a professional manner whilst showing your appreciation for the time spent under their authority. Your letter of notice will act as kind of meeting agenda, so it’s important that it is clear and concise and raises the subjects you want to confirmed, such as leaving date and outstanding contract pay. You should dictate the motion of the meeting when you make clear from the start that your mind is made up and your decision to leave is final. If you show signs of wavering then these may be picked up by your superior, and if they are keen to keep you then they may employ some tactics to help make you stay. The most common of these is the ‘buy back offer’. As most employers would rather not have go through the costly and time consuming motions of replacing staff, many try offering departing employees some perks to make them stay. These could be a pay rise, a promotion or any sort of wild promises for a better working life. It is very unwise to be drawn in by such bribes. With around 75% of staff who are ‘bought back’ leaving within the next 12 months, it seems the prizes and promises usually either fail to materialise or are not as desirable as they first seemed. Of course that’s not to say that the reasons you decided to quit in the first place wouldn’t re-emerge. You would probably still be in the same job and same company, and working for the same boss after all!